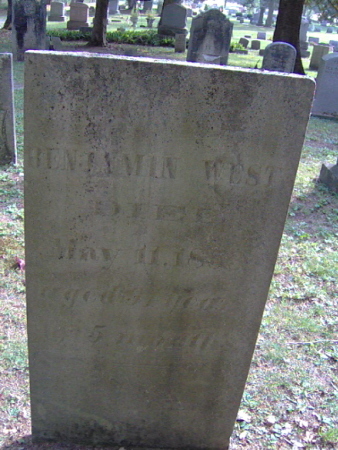 741 Benjamin West (Benjamin West, William West, Susannah Soule, George), b. Hopkinton RI, 30 Nov. 1761; died Verona, formerly Grafton, NY, July 1853 aged 91 years. He m. 4 Feb 1782 ELIZABETH DAVIS, dau. of John and Bethiah (Rogers) Davis, b. 15 March 1755; died Verona NY, 29 Nov. 1827. He with his brothers Rusemire and Thomas were original landholders of the Roxborough section of the Rensselaerwyck Manor as of 1791. He and his brother Thomas were residents of Oneida CO. NY when they executed a deed in Rensselear Co.25 Jan 1822. There is no probate in Rensselaer Co. NY. In Verona, N.Y., May 11th, Benjamin West, aged 91 years. Brother West was a member of the 2nd Seventh-day Baptist Church in Petersburg,, but he observed the Sabbath of the Lord. When re removed to Verona, he united with the Seventh-day Baptist Church, of which he remained a worthy member until removed by death to join the church above. References: Rogers Davis Fam Bible (sheets); JOHN DAVIS GEN, p. 111; SDB Record 8:32, p. 127; MAXSON FAM, p. 15; Rensselaer CO. LR 25:72 (Benjamin West). 181 Benjamin West (William West, Susannah Soule, George ), b. probably No. Kingtown or Newport RI ca 1730; died NY State 1782. 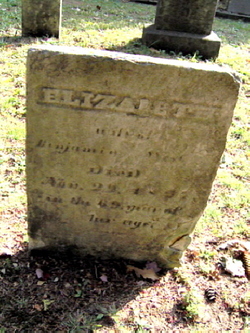 He m. Briston RI, 7 June 1753 ELIZABETH SMITH, dau. of Samuel and Elizabeth (Drown) Smith, b. Bristol RI 14 Dec. 1733. He was Benajmin Weast of Stonington CT 11 Feb 1754 and as Benjamin of Newport RI with wife Elizabeth on 25 July 1766 sold 6 acres in Westerly RI. He early became a member and then Deacon of the S.D. Baptist church of Hopkinton RI and emigrated to Burlington – Farmington CT before the revolution. He and two of his sons, Benjamin jr. and Hezekiah signed the Farmington Petition to the Connecticut legislature for permission to labor on the first day since their Sabbath was the seventh. Five of his children married five of the children of Elder John Davis of Hopkinton and Farmington CT. He died in NY State but his estate was probated in Farmington CT in 1782. However, no estate papers exist.On the plot map dated 1791-2 of Roxborough, Rensselaer Co. NY, he may be the landowner of property adjoining Rusemire, Thomas and Benjamin jr.
References: CT (Farmington) PR: 2906 (Benjamin West); CSL Barbour Index: Farmington; David (John) Gen; VR RI: Bristol; WEsterly RI LER 9:198, 10:164 (Benjamin West/Weast), Map: 10 Roxborough of Rensselaerwyck Manor, Rensselaer Co. NY. 36 WILLIAM WEST (Susanna Soule, George ), b. No. Kingstown RI 31 May 1681. He m. (1) ABIAH SPRAGUE, dau. of William and Deborah (Lane) Sprague, b. Hingham, 27 Jan, 1688/9, died before April 1721. Her father’s will dated 7 April 1721, probated in Providence RI, 11 Nov. 1723 named Deborah, John, William and Abiah West as his grandchildren. He m. (2) place unknown bef. 1725 JANE TANNER, dau. of Francis and unk (Babcock) Tanner. On 27 July 1741 the Charlestown RI Town Council ordered “William West, wife and children” be transported to No. Kingstown. William and some of his family were in W. Greenwich as guests of Benjamin Tanner by July 1742 when the Town Council asked Benjamin Tanner for an explanation. There are no Probate records. Children (West) first four by Abiah Sprague; five through eleven by Jane Tanner. i Deborah, b. ca. 1710; n.f.r. iv Abiah, b. bef 1721; n.f.r. References: MD 26:10ff; FAM OF PILGRIMS; Providence RI PR 2:158 (William Sprague); No. Kingstown RI LR (William West); Charlestown RI Town Rec Bk 1738; np (William West), SOULE NEWSLETTER 8 12304; SPRAGUE GEN. VR RI; HOPKINTON, NEWPORT. 5. 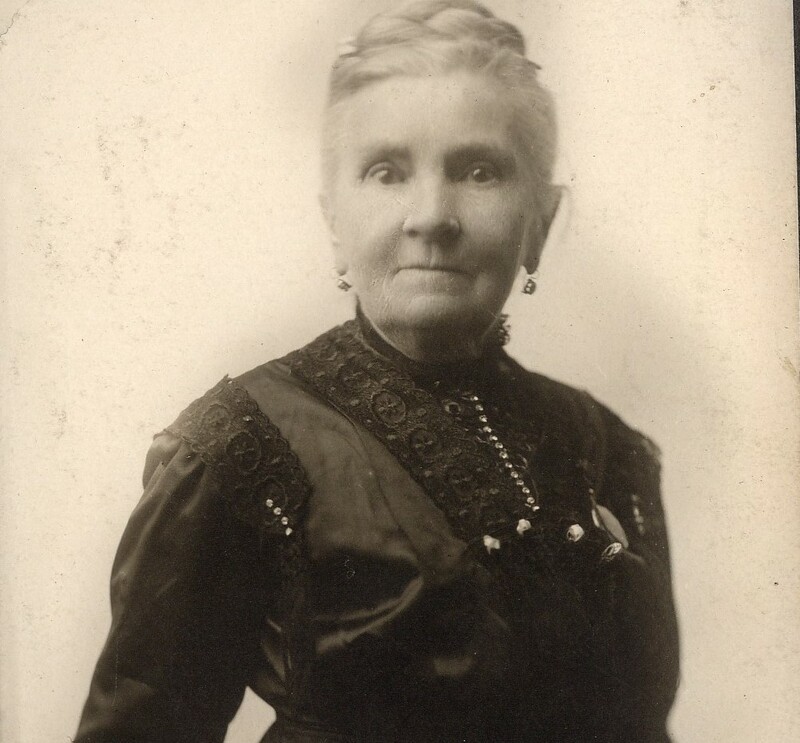 SUSANNA SOULE born probably in Duxbury pos. ca. 1642; died probably Kings Towne, Rhode Island on or after 1684. She married place and date unknown FRANCIS WAST/WEST and resided with him in that part of Kings Towne Rhode Island which became North Kingstown in 1722/3. We have been unable to find place or date of birth, date of death or parentage for Francis. When Gov. Andros took over the King’s Province in 1687, he levied taxes on the inhabitants of Kingstown RI – renamed Rochester. Included in the list were Francis Wast senior, Francis Wast junior, and Richard Wast. Only Francis senior had a rate, that of 2 shillings 1 pence. The children of this family have been difficult to trace. Francis, Susannah, and Martha remained in the Kingstown RI area; William removed to Newport RI, probably after the death of his first wife; Clement moved to Charlestown RI, and then disappears from RI records, perhaps moving to Dutchess County NY; Richard returned to Plymouth and Bristol County, living in Middleboro and Taunton. We have not found Peter, John nor Thomas. This family name has a variety of spellings in the public records: WAST, WEST, WASTE, WEAST being common variants. Of the four “WEST” families in Plymouth Colony only this family has its surname used in forms other than W E S T suggesting that the original name, while phonetically similar, was distinct from West. Some of Susanna’s children are identified in the Samuel West Memorandum Book published in the Mayflower Descendant. Children (WEST) b. in that part of Kings Towne which became No. Kingstown RI. iv. Peter, B. ca 1668/9; n.f.r. v. John, B. ca 1672; n.f.r. References: MD 26:10ff; NEHGR 35;12406, 181-185; FAM OF PILGIMS, pp. 138ff; VR RI; No. Kingston RI BK 1:30. For the young ones in the family here is a story of the Indian friends of Pilgrim George Soule. These stories are taken from the Soule Kindred Newsletter Volume Xii, No. 1, January 1978. 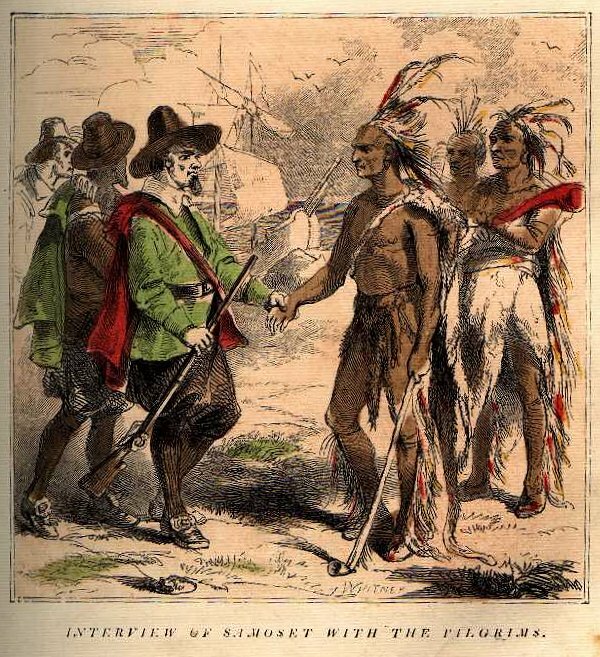 There were at least four individual Indians who were close friends with the Pilgrims. One famous Indian was the Great Sachem (Chief) of the Wampanoags. This assures us that George was very familiar with Indians and their ways. The first acquaintance the Pilgrims made was with a handsome man called Samoset. On a fair warm day in March 1621, Miles Standish had called George Soule, John Alden, and John Howland along with all the other stronger men together to finish some military orders they had started before but had been interrupted. Suddenly the men looked up to see a nearly naked savage. They were alarmed, but they watched as he walked on very boldly between the newly built houses. He presented himself to them where they stood and said in perfect English “Welcome!” Can you imagine the surprise and amazement George felt? We know Samoset was handsome because the Pilgrims called him “seemly” a word which meant the same. He had learned English from the English fishermen who came to fish at Monhiggan Island. He had come to Plymouth eight months before. The wind came up a little and they put a coat about his shoulders as he wore only a leather about his waist with a fringe about a span long. He was a tall, straight man, the hair of his head black, long behind, short before and no hair on his face at all. He carried a bow and two arrows, one headed and one unheaded. They talked all afternoon with him and when he did not choose to leave they decided to put him on shipboard for the night as a safety measure. The Mayflower lay at anchor in the bay but the wind was high and the tide running out so they lodged him that night at Stephen Hopkins house. They watched him throughout the night but he slept soundly and left in the morning. He left with a promise to return later with a friend of his who could speak even better English than he. He said the name of his friend was Squanto. 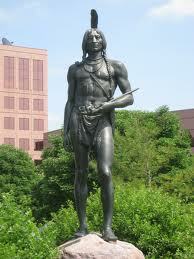 Very little is known of Massasoit before the Pilgrims came to Plymouth. He was born in 1580 and became Sachem of the Wampanoags in 1607. He had the reputation of being a great warrior in his youth. He had an able body, was grave of countenance and spare of speech. In his dress he appeared little different from his followers except a great chain of white bone beads about his neck. He signed a treaty with the Pilgrims which was kept until he died. He was well respected by the Pilgrims and became a close friend of Edward Winslow whom he called, “Win-snow.” Once when Massasoit thought he was dying, Winslow traveled to his home in the tribe and treated him. Winslow wrote of this very touching time of warmth and understanding between them. In 1655 Edward Winslow died. (George Soule came to America on the Mayflower as a tutor to Edward Winslow’s children.) Massasoit knew his time was running short so he turned over his leadership to his sons, Wamsutta and Pometacon. Thinking it might keep up good relations with the Pilgrim Colony, he ordered his sons to go to Plymouth to adopt English names. The magistrates were so impressed with the regal bearing of the two young giants that they named the older one Alexander and the younger, Philip, after Alexander the Great and Philip of Macedon the two great kings who lived long ago. Sometme in 1662, Massasoit died. Many Indian dignitaries came, and many beautiful words were spoken at the services for this man of peace, but perhaps the most moving tribute was made almost forty years earlier when Hobomok spoke the tribute (below) to the Great Sachem when he told Edward Winslow. 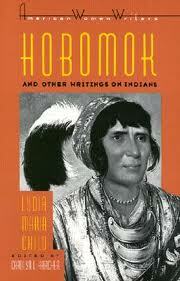 This illustration of Hobomok is from the book by Lydia Maria Child. It’s Thanksgiving time and as you share your blessings with your family and friends this year here is some new information about our family heritage. For several years I have researched our early ancestors migration from England to America. Ancestors from the Bernard Hancock family line include the Thomas Brigham family who came to America in 1634 and settled in Marlboro and Cambridge, Massachusetts. 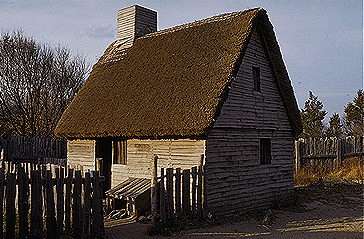 The Robert Goodell family came to America in 1634 and settled in Salem, Massachusetts. On Mary Frances Foreman (Hancock) side of the family George Squires marriage records indicate George was married in Concord, Connecticut in 1639 and he died in 1691 in Fairfield, Connecticut. Daniel Scofield, son of Sir Cuthburt Scofield came to Connecticut in 1639 and paid 25 pounds sterling for ten acres as a founder of Stamford, Connecticut. But the most exciting discovery I have made in the last few months is that of George Soule, a signer of the Mayflower compact. His descendents are part of the Mary Frances Foreman (Hancock) line through her grandmother Mary Salina Kenyon Squires. Here is the story as published in the Mayflower Families Through Five Generations, ‘Descendants Of The Pilgrims Who Landed At Plymouth, Mass. December 1620’ published by the General Society of Mayflower Descendants, 1980. 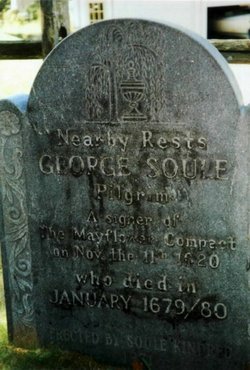 George Soule, born in England probably between 1593 and 1600, died in Duxbury before 22 Jan 1679 (O>S>) when his inventory was taken by Edward Southworth and Thomas Delano. The tentative dates for his birth are based on his signing of the Mayflower Compact in 1620 and his death in 1679. As a signer of the Compact he must have been twenty, the known age of Gilbert Winslow. Since a life span of eighty-five was rare in those days he was born probably not much earlier than 1593. The wife whom he married probably in Plymouth before 1626 was Mary Bucket (Becket) who arrived in Plymouth before 31 July 1623 aboard the Anne. She died in Duxbury in December 1676. She has not been identified. Probably no other of the Pilgrim band has been so exhaustively researched as George Soule. Charles Edward Banks, himself a descendant of the Pilgrim, spent years attempting to determine the antecedents of his ancestor. Roland Soule tells us that “after studying all available American records he made a ‘long sojourn’ in England in 1922 and 1923 in an effort to determine the Soule parentage”. In the chapter written by Banks for Gideon G.T. Ridlon’s “Sole, Solly, Soule, Sowlee and Soulis”, Banks had cited as the father of George Soule, Robert Soule of Eckingham whom, he reported, had three sons Thomas, Robert and George named in his will of 1612. Banks’ conclusion was that George the youngest son, ‘answers best of all the candidates the demands of identification in point of time, locality and relationship to the Sole family which had contact with Governor Winslow in London and Worcestershire”. However, later in the same chapter he stated that the parish records prior to 1612 had been lost but that “an examination of the years remaining show that a George Soule married in 1631 and that a Nathaniel Soule, presumably his son, was baptized three years later”. This then disposed of George, son of Robert, since he could not have been the Pilgrim. In recent years extensive searches have been made in English parish records but despite all these investigations the parentage and a birthplace of George Soule are still undiscovered. A most interesting and thought provoking article by Roland P. Soule on a possible father for George Soule appeared in the Soule Kindred Newsletter for October 1978. The search still goes on. George Soule joined, probably in London, a company of adventurers off to the New World. His status is clearly established as a “servant” to relatively wealthy Pilgrim Edward Winslow, also as a signer of the famed Mayflower Compact of 11 Nov 1620, O.S. It appears logical, therefore, to assume that Winslow bore the cost of his passage to Plymouth aboard the Mayflower. The original New Plimoth Colony Records, William Bradford’s “Of Plimoth Plantation, 1620-1647”, Plymouth Registry of Deeds and Probates, Bristol County Registry of Deeds, Plymouth Town Records, Duxbury Town Records and other authoritative sources provide sufficient evidence upon which to base a comprehensive sketch of George Soule’s life in New England. Unlike some of his colleagues, he never returned to his homeland. However, suffice to say that he became a relatively well-to-do leader, business man and office holder in Plymouth Colony. As early as July 1627 George Soule was one of a group of fifty-eight “Purchase or Old Comers” who assumed Plymouth Colony’s debt to “The Adventurers”, the promoters and capitalists who financed the voyage of the Mayflower and other early ventures and expenses of the colony. In return the group received profitable trading concessions in Maine, at Cape Ann, on Buzzard’s Bay and subsequently on the Connecticut River. The General Court voted 5 March 1639/40 to pay these “Purchasers or Old Comers” for the surrender of their patent. Existing land records show tha he acquired extensive holdings in Duxbury, Dartmouth, Middleboro, Marshfield and Bridgewater but resided only in Plymouth and Duxbury or “Ducksburrow” as it was called originally. On 27 Sept 1642 he appeared before the General Court as one of two “Deputies” or representatives from Duxbury, Plymouth Colony having established representative government in 1639 after finding it no longer practicable to have all the colonists participate as individuals. The representatives were limited to terms of one year and denied the right of succession so we find George Soule serving each alternate year for many years, with increasing assignments such as forming a committee 26 Oct 1646 with Anthony Thatcher “to draw up an order concerning disorderly drinking of tobacco”. i.	ZACHARIAH3 SOULE, b. 1627, Plymouth, Plymouth, MA; d. Bef. Dec 11, 1663, Duxbury, Plymouth, MA; m. MARGARET FORD, Nov 22, 1646, Plymouth; d. Aft. Mar 1664. He died during the 1663 Canadian Expedition and his estate went to his brother John. 2.	ii. JOHN SOULE, b. 1632, Plymouth, Plymouth, MA; d. 1707, Duxbury, Plymouth, MA. 3.	iii. NATHANIEL SOULE, b. 1637, Plymouth, Plymouth, MA; d. Oct 12, 1699, Dartmouth, Bristol, MA. 4.	iv. GEORGE SOULE, JR., b. 1639, Duxbury, Plymouth, MA; d. May 12, 1704, Dartmouth, Bristol, MA. 5.	v.	SUSANNAH SOULE, b. Apr 25, 1642, Duxbury, Plymouth, MA; d. Jan 2, 1684, North Kingstown, Washington, RI. 6.	vi. MARY SOULE, b. May 1644, Duxbury, Plymouth, MA; d. 1720, Plymouth, Plymouth, MA. 7.	vii. ELIZABETH SOULE, b. 1645, Duxbury, Plymouth, MA; d. 1700, Woodbridge, Middlesex, NJ. 8.	viii. PATIENCE SOULE, b. 1648, Duxbury, Plymouth, MA; d. Mar 11, 1706, Middleboro, Plymouth, MA. ix. BENJAMIN SOULE, b. 1651, Duxbury, Plymouth, MA; d. Mar 26, 1676, Pawtucket, Providence, RI. Killed in action by Indians before Pawtucket, RI, on March 26, 1676 during King Philip’s War. Nothing has been found to suggest that he married or ever sired any children. The second generation of our descendants comes from George’s daughter Susannah Soule who married Francis West. The line continues with their son William West, his son Benjamin West, his son Benjamin West, his son Joseph West, his daughter Adelia C. West who married Thomas Kenyon their daughter Mary Salina Kenyon who married Edwin R. Squires, their daughter Grace Irene Squires who married Robert Sidney Foreman, their daughter Mary Frances Foreman who married Bernard Hancock, their children, 1)Grace Evelyn 2)Pearl 3)Charlotte 4)Charlene 5)Dorothy 6)Shirley and 7)Robert Hancock.